I’ve been using the upgraded version of the foursquare iOS app for the past couple weeks, and have definitely been curious about what it means for foursquare’s overall direction. There’s more depth within the news feed – before, opening the app simply displayed a list of your friends and their recent checkin. It halfway felt like a news feed, but the checkin was the only data you were presented with. 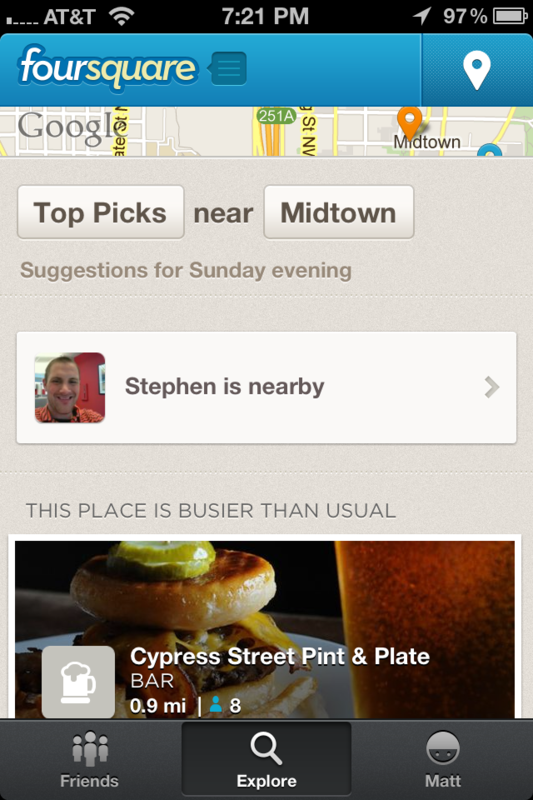 Now, you can see new friendships, tips being left, as well as back-to-back checkins. At first I found this annoying, but after getting used to it, the app feels more dynamic and real-time. The design also now matches the website more closely – especially with font choices. While there’s obvious value to be had from an enterprise level by looking at everyone’s data on the whole, for me as a user, better recommendations are the most exciting prospect of foursquare’s future. When you look at the “Explore” tab, you’re presented with a stream of potential places. These can range from nearby venues that have a large number of current checkins, venues your friends frequently visit, and venues that fit a certain category (shopping, dinner , etc). While this is great, I’d love to see even more advanced recommendations that lean heavily on what you’ve done in the past. Here’s where you’ve been, so based on the time and date, as well as what your friends are doing, here’s the one best thing you should do right now. They’ve taken a large step in this direction and I can’t wait to see what’s next.